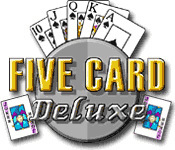 Five Card Deluxe is rated 4.5 out of 5 by 4. Rated 3 out of 5 by mrm2006 from It's Just an OK Poker Game. I guess I'm in the minority here - didn't LOVE LOVE LOVE the game and this review is based on only 20 minutes of game play. So, take it or leave it. For me, it was incredibly boring. 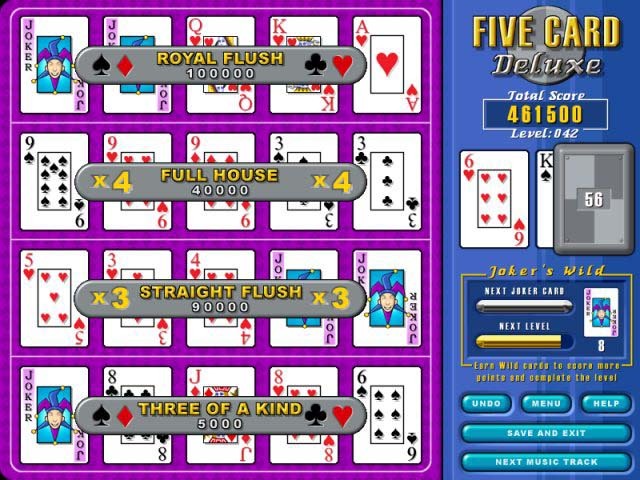 You have 4 different types of poker games to play: Freestyle, Challenge, Joker's Wild and one more, sorry. I played Joker's Wild as that's my favorite game. But all the other games are based on the same premise. The game board consists of 4 rows of 5 empty spaces each. To the right of that is a deck of cards. You have a visible card which you use to "play" your hands. And, behind that you have a partially visible card. Take the visible card and place it somewhere in one of the empty spaces in the 4 rows of 5 empty spaces each. Imagine these rows of 5 are your poker hands. Each card you see is your next card. Now, make each card count and place it so you can get a decent hand. Even a pair is good because it will clear that row for more cards. If you cannot even place cards to make a pair that row (or hand) will lock and can no longer be used. That's how to play the game. There are Joker's galore, it seemed. The game just had no challenge whatsoever. You knew the cards that were coming so you were ahead of the game in knowing how to place them. You could strategize for the best hands. It would have been better to have the same game board and the same premise of play, but do something like have the cards you have to play with turned face down. So, until it was flipped over by the "game" itself, you didn't know what to do. And, allowing only "x" amount of time to place the card. Anyway, not a purchase for me. I have yet to find a great poker game on the BFG site. 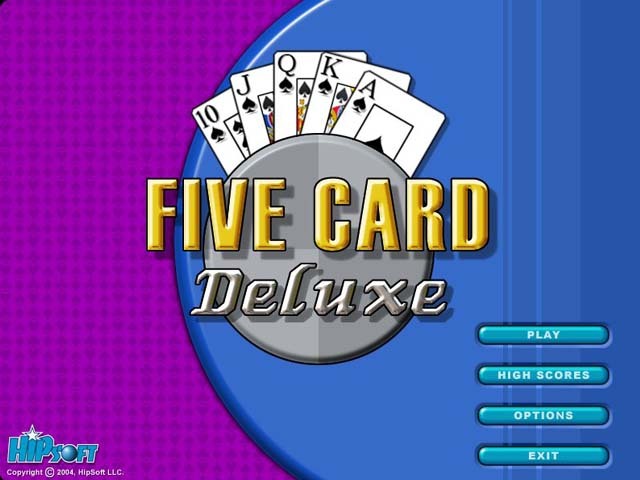 Score enough points to advance to the next level in this classic card game!